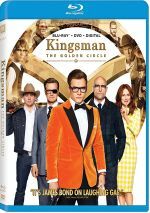 When their headquarters are destroyed and the world is held hostage, the Kingsman's journey leads them to the discovery of an allied spy organization in the US. Back in 2015, Kingsman: The Secret Service introduced us to Gary “Eggsy” Unwin (Taron Egerton), a London street kid who turned into a super-spy. 2017’s Kingsman: The Golden Circle details his further exploits. 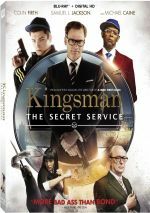 After the destruction of their headquarters, the secret Kingsman agency winds up reduced to two members: Eggsy and tech expert “Merlin” (Mark Strong). As they attempt to regroup, they discover the existence of “Statesman”, a US organization that mirrors Kingsman. Along with the assistance of the American agents, Eggsy and Merlin trace the menace to Poppy Adams (Julianne Moore), a drug lord who operates from a secret location in Cambodia. She uses her product to spread a deadly virus, a task that Eggsy and company combat. Secret Service offered an unusually good action film, one that reflected obvious influences – primarily James Bond, of course – but that managed to go its own way. It delivered a thrilling ride and became one of the best action flicks I’ve seen in years. This set up high expectations for Circle, elevated hopes that it can’t quite achieve. Some of that may stem from the absence of surprise, as we go into Circle with a certain level of anticipation absent from the release of Service. The 2015 flick brought us a blast of fresh air, and the filmmakers can’t surprise us twice. Still, I hoped that Circle would give us at least 75 percent of the same excitement we got from Service, and I also felt that the absence of “origin story” would free the narrative to become more active and involving in its own right. And it does – to a degree. Circle offers enough excitement to stand as an enjoyable tale, but I admit it feels like a disappointment after the highs we got from Service. Some of the issues stem from the movie’s length. Whereas the first film packed a lot of origin exposition and a main terror into its 129 minutes, Circle takes 12 minutes more to develop a less detailed tale. Truly, there’s no reason Circle needs to go so long, and the viewer seems likely to feel that running time. The film sags too often and lacks the dynamic energy of its predecessor. Still, even with these occasional lulls, Circle manages a fair amount of good action, and I like the addition of Moore. She plays Poppy as delightfully unhinged and adds a quirky layer to the proceedings. Circle brings a mix of additional new “name” actors, but they don’t make a great impression, mainly because they don’t get a lot to do. In theory, the presence of folks like Halle Berry, Michael Gambon, Channing Tatum and Jeff Bridges adds spark, but their roles don’t provide enough substance to make a dent. To my surprise, a cameo from Elton John offers the most fun. He shows a delightful willingness toward self-mockery and brings us a lively boost to the story. Ultimately, Golden Circle delivers a mostly enjoyable action flick. It doesn’t live up to expectations but it throws enough excitement our way to make it worth a look. 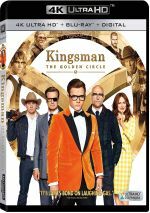 Kingsman: The Golden Circle appears in an aspect ratio of approximately 2.39:1 on this Blu-ray Disc. The movie offered a strong presentation. Sharpness worked fine, as the film seemed accurate and well-defined. I saw no signs of jaggies or moiré effects, and the film lacked edge haloes or print flaws. If you suspected Circle would come with the modern standard teal and orange palette, you’ll get what you expected, and these became heavy tints. I’d like to see action flicks dispense with those conceits, but given their restraints, they looked fine here. I also felt happy with the solid DTS-HD MA 7.1 soundtrack of Golden Circle, as the mix offered plenty of opportunities for lively auditory information, and it took good advantage of these. From the opening scene on a plane to road chases to gunfire to explosions to other action elements, the mix filled the speakers on a frequent basis. The track placed information in logical spots and blended all the channels in a smooth, compelling manner. In terms of extras, the main attraction comes from Inside the Golden Circle, a nine-part documentary. It fills a total of one hour, 57 minutes, 13 seconds with info from writer/director Matthew Vaughn, editor Eddie Hamilton, production designer Darren Gilford, makeup designer Amanda Knight, hair designer Lisa Tomblin, stunt double Michael Rawlins, special effects supervisor Steven Warner, VFX supervisors Chris Lawrence and Mark Breakspear, CG supervisors Fabio Zangla and Jim McLean, animation supervisor Max Tyrie, compositing supervisor Chris Zeh, capture supervisor Richard Graham, senior VFX supervisor Angus Bickerton, sound supervisor/sound designer Matthew Collinge, co-composer Matthew Margeson, and actors Mark Strong, Halle Berry, Julianne Moore, Colin Firth, Taron Egerton, Edward Holcroft, Channing Tatum, Pedro Pascal and Jeff Bridges. “Inside” looks at story/characters and challenges related to the creation of a sequel, cast and performances, set design and locations. We also learn about costumes and weapons/gadgets, stunts and action, various effects, editing, music and audio. With almost two hours at its disposal, “Inside” comes with plenty of breathing room, and it largely uses the space well. While it can seem a bit fluffy at times – usually related to the actors – the show mostly delivers a solid look at the production – especially when we see the ample footage from the set. Black Cab Chaos: Anatomy of a Killer Chase lasts 12 minutes, 49 seconds and features Vaughn, Holcroft, Bickerton, Warner, Lawrence, Zangla, art director James Morall, and special effects senior technician James Ferguson. As anticipated, “Chaos” looks at the work done to complete the movie’s opening action sequence. It delivers a fun take on the material. In addition to two trailers, Kingsman Archives brings us two galleries: “Concept Art” (36 elements) and “Stills” (52). Both offer some good images, though “Concept Art” seems much more engaging. A second disc provides a DVD copy of Circle. It includes the “Chase” featurette and the “Archives” but it lacks the other extras. After the great thrills of the first flick, I hoped Kingsman: The Golden Circle would provide another top-notch action tale. While it doesn’t live up to its predecessor and it sags at times, Circle still works pretty well in its own right. The Blu-ray boasts terrific picture and audio along with a fairly good collection of supplements highlighted by a long documentary. Circle turns into a mostly enjoyable adventure.